Chris-Craft may be two words, but its place in boating history is singular. Founded by Christopher Columbus Smith (seriously, with a name like that how do you not get into something boating related), the story goes back to the late 1800s. But, the era most people associate with Chris Craft is the mid-1900s. That was the age of large cruisers like the Constellation, not the many runabout models that have been produced since. The last mahogany boat, a Constellation actually, rolled off the line in 1971 and then it was all fibreglass. But, because they were so well built and many have been so lovingly cared for, the old woodies remain very popular on many larger lakes. I was lucky enough to be invited to check out a 1966 Constellation on a beautiful summer day near Orillia, Ontario. This boat was number 47 of 55 produced for 1966. The current owner, Gord Dimick, is only its third titleholder and he’s had it for well over a decade. Gord has lovingly maintained it and kept as much of JENSA III original including the two 427 Ford Big Blocks that power it. 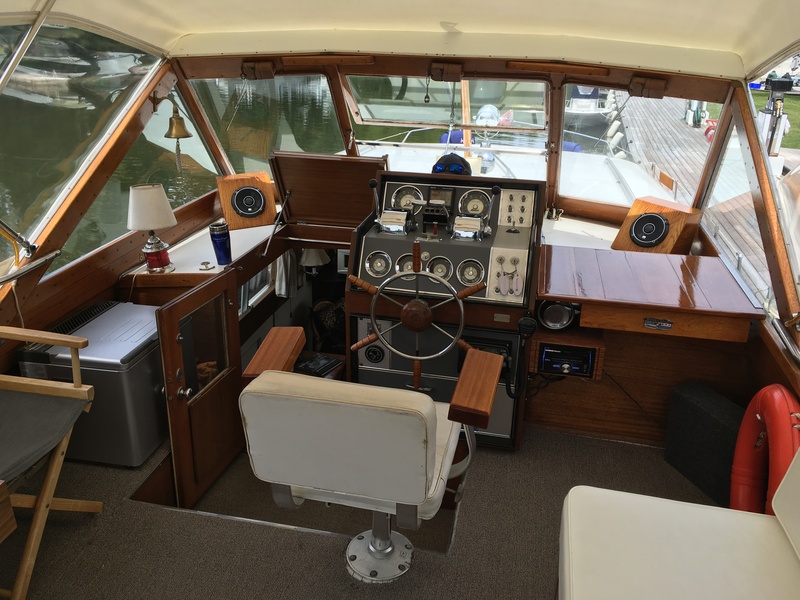 However, given that they are half-a-century old he has never pushed them full throttle and when he let me take the wheel of his prized vessel, I wasn’t going to risk it for the sake of our spec sheet! 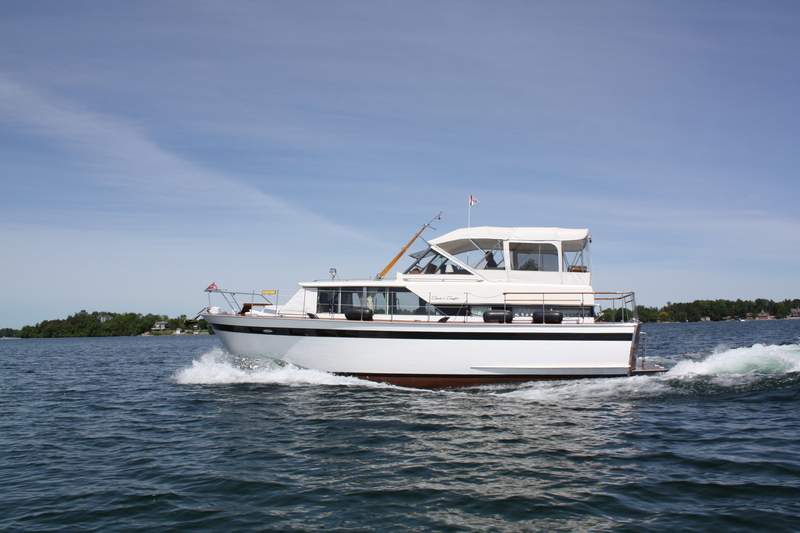 This 40-foot wooden cruiser will get you where you’re going in style, not speed. Though the previous owner claimed to have hit 19 knots (21.9 mph) on a few occasions, Gord has only ever pushed the Constellation as high as 16 knots (18.4 mph). He says the happiest cruise for captain and Chris-Craft is 10 knots (11.5 mph) and I agree. As a bonus, the hull design with deep keel means it handles very nicely at slow speeds which is always luxurious around the dock. When you’re tied off you can leave the wood-adorned cockpit—with custom speaker boxes, table and shelf, designed to match the original look—and venture down below. 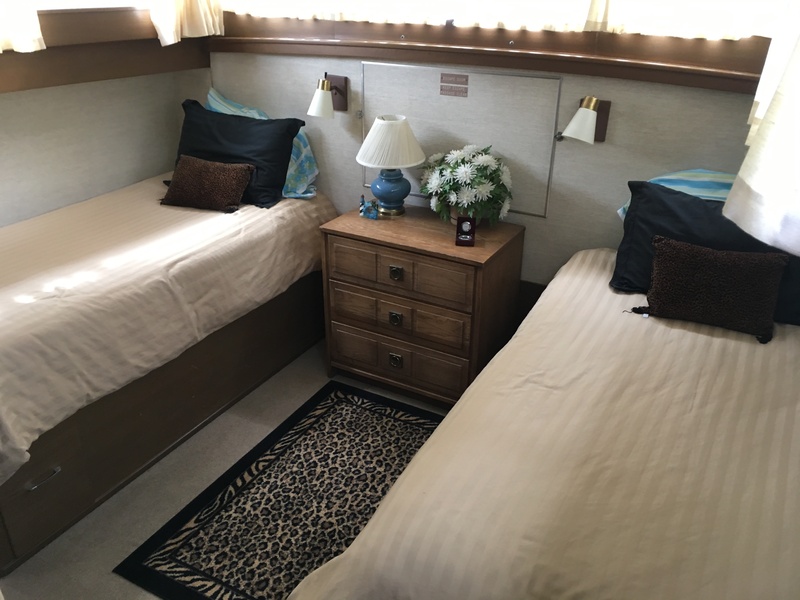 The aft-cabin master stateroom is full-beam and, telling of the clever design to maximize space, the twin beds are actually built over top of the fuel tanks. No dead space down here. Climb up back up few steps and you’re in the mid-ship salon with galley, seating and large windows to open up the space. 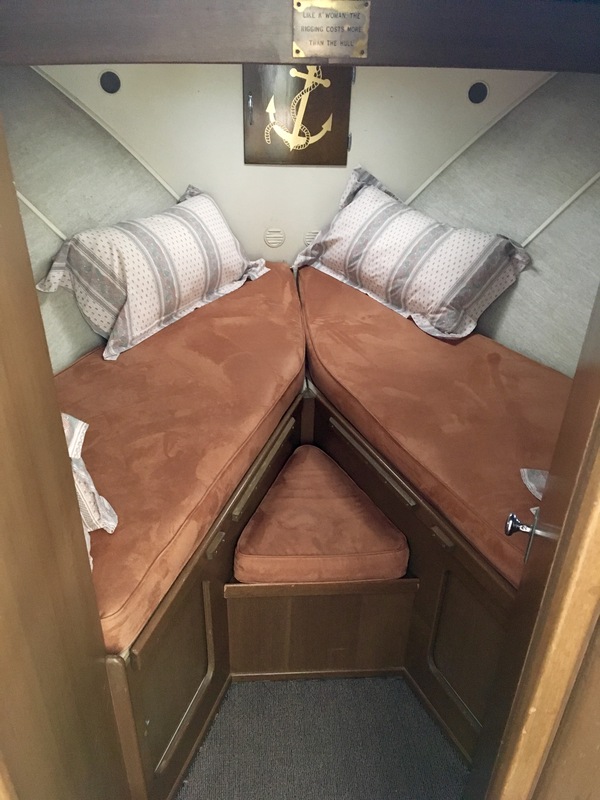 With ample head room and an aft-cabin master I was amazed at how roomy it was given it was “only” a 40-footer. The modern designs of similar size have shied away from the big living spaces for more day-boating fun up in the cockpit and sleek designs for aesthetics and performance. Forward is the head to port and a V-berth at the bow which, admittedly, would not be the single most comfortable accommodation option I’ve seen, but still a great spot for kids and perfectly suitable for guests if you upgrade to good mattresses. I’ve always been a big fan of history and I love boating, so getting a chance to marry those two and spend the day on a legend of the cruising world was something special. As I was about to leave, Gord pointed out one more thing that he admitted wasn’t original, the small table at the bow. 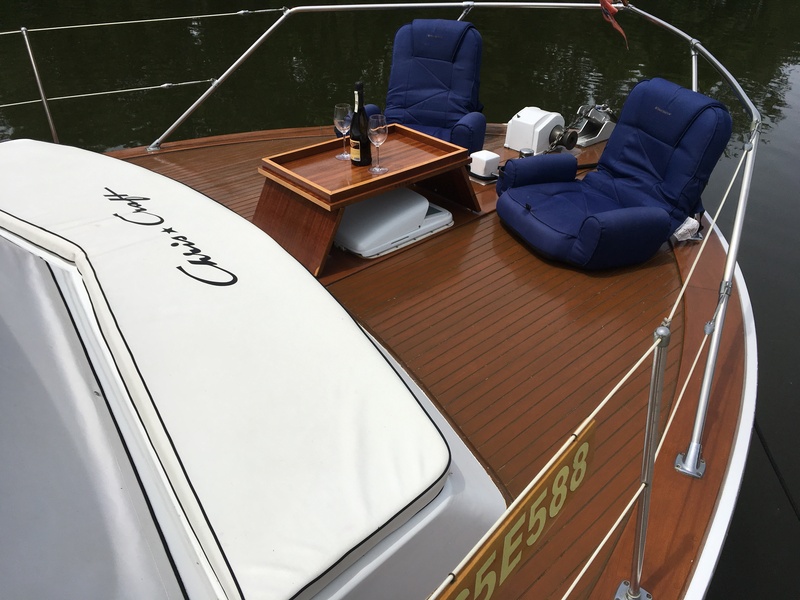 There is a little bench built-in right above the bow V-berth and I knew the folding chair backs were modern touches, but the wooden table was the same colour and style as the rest. It even had the Chris-Craft logo. “I built that out of wood from our old piano,” Gord added with a smile. Honour the past, but make it your own. That’s the key. This test is featured in the Fall 2016 issue of Boats&Places.